This plugin integrates Quickbooks online, a business accounting software with J2Store Joomla eCommerce solution. 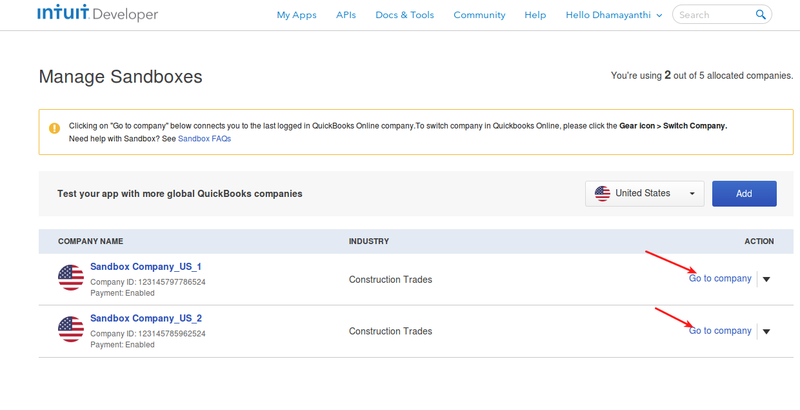 The app integrates only with the QuickBooks Online edition. If you have an offline edition, consider migrating to online and the migration is very smooth. You should have following minimum requirements to use this app. PHP OAuth extension should be enabled. If you don't know what OAuth extension is, contact your hosting provider and ask them to enable it for you. Cron job should be enabled. Otherwise the app will not work. You must have atleast J2Store version 3.2.21 to use this app. The CRON JOB has to be created in order to perform the synchronization of orders and customers with Quickbooks properly. 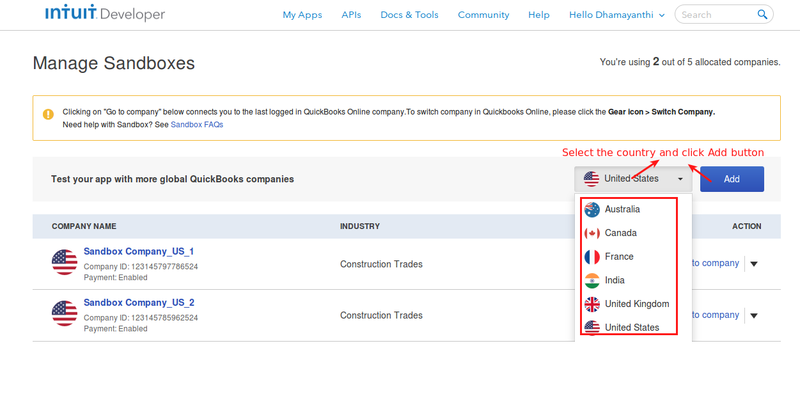 https://www.example.com/?option=com_j2store&view=queues&task=processQueue&queue_key=<queue key>&queue_type=app_quickbookQueue key could be found under J2Store > Setup > Configuration > Store tabReplace www.example.com with your domain. Install the downloaded package through Joomla installer. 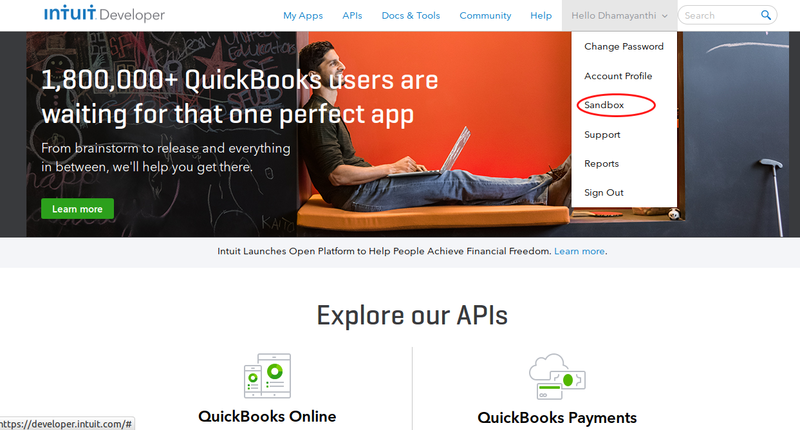 After installing, go to J2Store > Apps and activate Quickbook Online. Once enabled, open the app and configure the basic settings. As soon as an order is placed in your online store, it will be synchronized with your QuickBooks account.You do not need to manually create any records in your accounting page. The order data including the itemized data will be sent to quickbooks. The the customer data including their address and email will be synchronized with your quickbooks account. The app checks for duplicates before attempting to create the customers. Do you already have hundreds of orders and customers in your online store. No worries. The app has a synchronize option to send the existing order and customer data. If you are accepting credit card payments, you would probably want to mark the invoices as paid immediately after they were created.The app could do that automatically for you. You can choose an income account to create the payment-received transactions. The transactions are queued before being sent to quickbooks. So there is no performance overload or delays when customers make orders. Even if the communication between quickbooks and your online store is interrupted, the transaction will be re-queued. You can also manage the transaction records in queue. Where to find Company ID in sandbox ? Create a sandbox from your total allocation via the Manage Sandboxes page. Once logged in to Intuit Developer, click either the Tools dropdown or the dropdown arrow next to your name from the menu on any page and choose Sandbox. 2. The Manage Sandboxes page displays. Next, select the country and the click Add from the Manage Sandboxes page. 3. A US sandbox is provisioned automatically. You can have up to four additional sandboxes distributed as you like across the AU, CA, FR, IA, UK, and US development regions. 4. Select the country from the dropdown and click Add button. 5. Once a sandbox is created, you cannot change its country designation. Once logged in to Intuit Developer, select Sandbox from the Docs & Tools landing page or from the dropdown arrow next to your name. The Manage Sandboxes page displays. To open a QuickBooks Online sandbox, click Go to company for the desired sandbox. It redirects you to the sandbox company home page where you can use ctrl+Alt+/ from your keyboard to see your company ID. The popup window will show your company ID. Where to find App token, consumer key, consumer secret ? 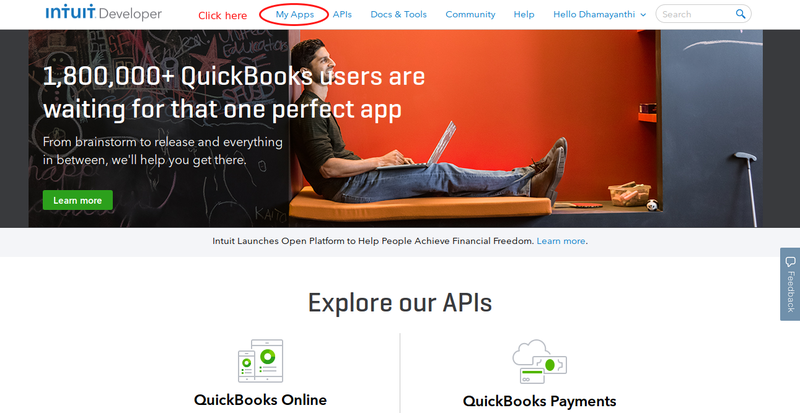 Go to https://developer.intuit.com and Sign in to your Intuit Developer account. After signing in, from the menu on any page, click My Apps. The resulted page displays you the list of app that you have created already. Find the app you want keys for and click on it. The app opens to the Development tab. If you don't have any app, Click the Create new app button. Click the Select APIs button. Popup window will be dispayed. 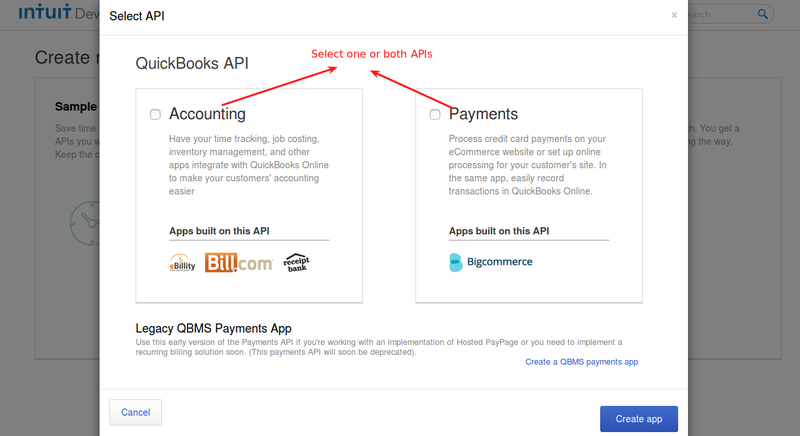 Select one or both of the QuickBooks Online APIs: Accounting and/or Payments and click Create app button. Your new app opens to its Dashboard tab. Click the Keys tab on either Developement tab or Producttion tab. Development keys—use only in the sandbox environment. You see your token and keys listed. Copy them and paste it in our Quickbooks online app's configuration. Quickbooks offers sandbox feature for testing purpose. If you would like to use Sandbox account to test, set this option to YES. Change Payment status Paid ? If you want to change payment status to PAID, set this option to YES. If you are accepting credit card payments, the app could mark the invoices as paid immediately after they were created. Our quickbooks allows to auto synchronize your zero price order with Quickbooks online. Choose YES, if you want to synchronize order total zero. Orders with status selected here are synchronized to Quickbook. For example, choose Confirmed. So the app will synchronize the order whose order has status confirmed. Don't enable DEBUG mode in live site. You will have fill all the required fields below to connect to your Quickbook production account. Enter company ID associated with your Quickbook's live account. Enter consumer key associated with your Quickbook's live account. 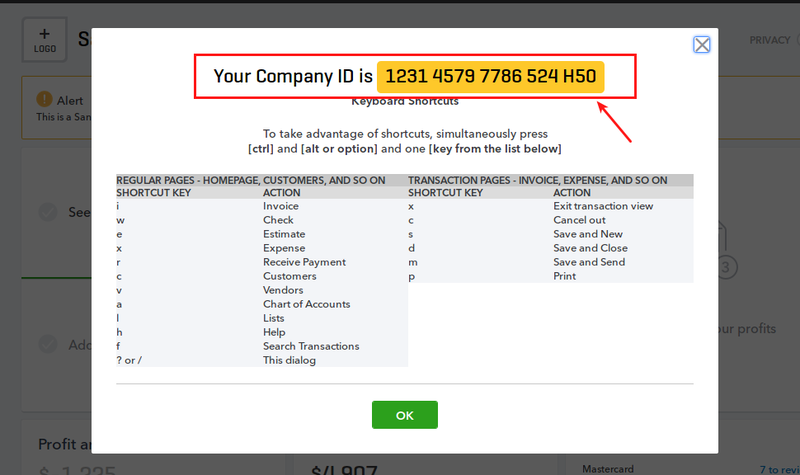 Enter consumer secret key associated with your Quickbook's live account. Enter Access token associated with your Quickbook's live account. Enter access token secret key associated with your Quickbook's live account. 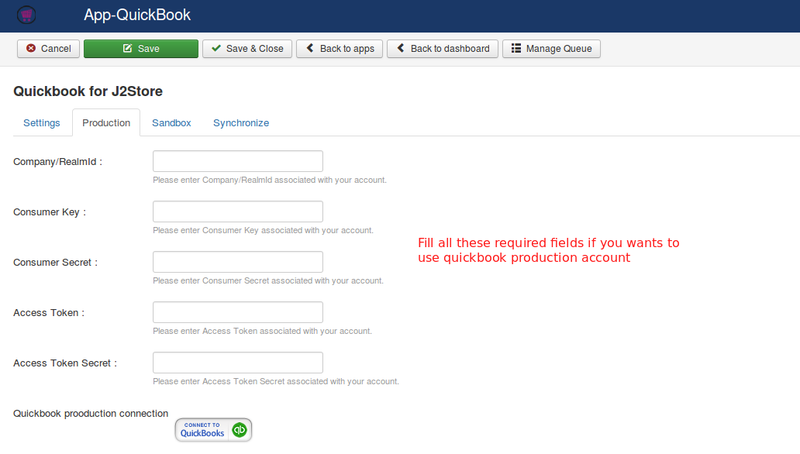 Quickbook production connection : After entering all the required data such as company id, consumer key, consumer secret, Access Token, click on connect to QuickBooks to connect Quickbook production app. Enter company ID associated with your Quickbook's sandbox account. Enter consumer key associated with your Quickbook's sandbox account. Enter consumer secret key associated with your Quickbook's sandbox account. 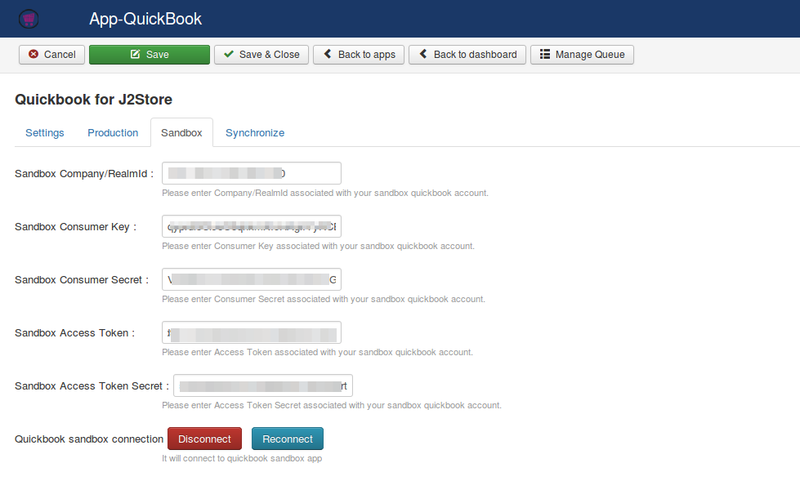 Enter Access token associated with your Quickbook's sandbox account. Quickbook sandbox connection : After entering all the required data such as company id, consumer key, consumer secret, Access Token, click on connect to QuickBooks to connect Quickbook sandbox app. Click on button named "Customer" to synchronize J2Store customer to Quickbook customer. 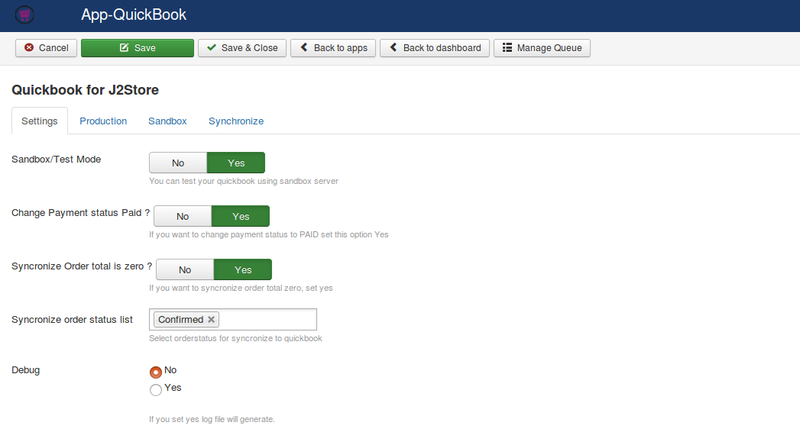 Click on button named "Invoice" to synchronize J2Store invoice to Quickbook.